Prosecco is easily Italy’s most popular sparkling wine and Tenuta Sant’Anna Prosecco is one of the best out there. If you prefer your Prosecco in a drier style, you want to be looking for a ‘Brut’, which is allowed between 6 and 12gr of residual sugar per litre. TSA Prosecco Brut averages 8/9 g/L. 100% Glera from estate-owned vineyards. 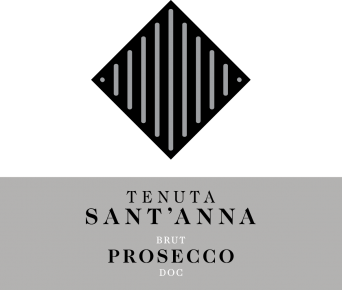 Tenuta Sant’Anna Prosecco Brut is light, with refreshingly fine bubbles, a fresh bouquet of acacia flowers which gives way to aromas of white peach and rennet. Lively with a creamy perlage. An excellent aperitif, it may be served with all seafood-based dishes, from appetizers to light risottos to second-course fish dishes. Serve well chilled. Harvested grapes are de-stemmed and crushed gently. The must obtained is transferred to steel vats where fermentation takes place at controlled temperatures. Then the so-called ‘charmat method’ of making sparkling wine begins: a selection of yeasts is put in the tanks to trigger a secondary fermentation which, over a period of 4 months will transform the wine into a refined sparkling wine. Fermentation is stopped by raising the temperature when the desired residual sugar is obtained in the tank.